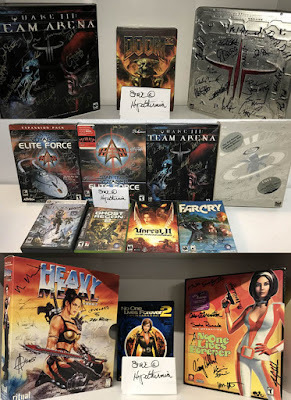 Quake 3 Autographed Games Donation Drive UPDATE! I have upped the ante (and your odds of getting one of these games) by including even more autographed games to the list. A $5 donation gets your name in the hat (up to $50). Only 350 spots are left out of 500. All donations must have "Q3 Donation" (without quotes) in the subject. Proceeds go to St. Jude Children's Hospital. This is a global giveaway, we ship anywhere. DONATE HERE. Here's a great way to donate to charity and, with any luck, also get your hands on one of these three amazing autographed games at the same time. All three of these games were signed by the entire development team at id Software, including John Carmack, making them extremely valuable and incredibly rare.